Race organiser Alan Rosner and I had been in his Volvo for a few hours reccying the roads, byways and green lanes for the 2012 edition of the Dengie Marshes Tour when I asked him why, it’s such a complicated a route? His response was that had he wanted to organise a race that stood out and which was different. He was also a fan of Paris Roubaix and the Rutland Melton Cicle Classic road races. Alan didn’t do bland and the race was never that and just a few weeks after Alexandre Blain (Endura Racing) won a spectacular race, Alan passed away. Alan Rosner was a fan of the Paris Roubaix road race classic and the UK’s Ciclos Rutland/Melton Classic, which caused him to winkle a course and a race for 2008 that Guy Andrews in the Rouleur Annual of that year wrote: “This race is unique to this book. It is a British amateur road race ridden by club riders and aspiring champions, so it’s hardly a classic in the Belgian sense of the word. So why is it included here? 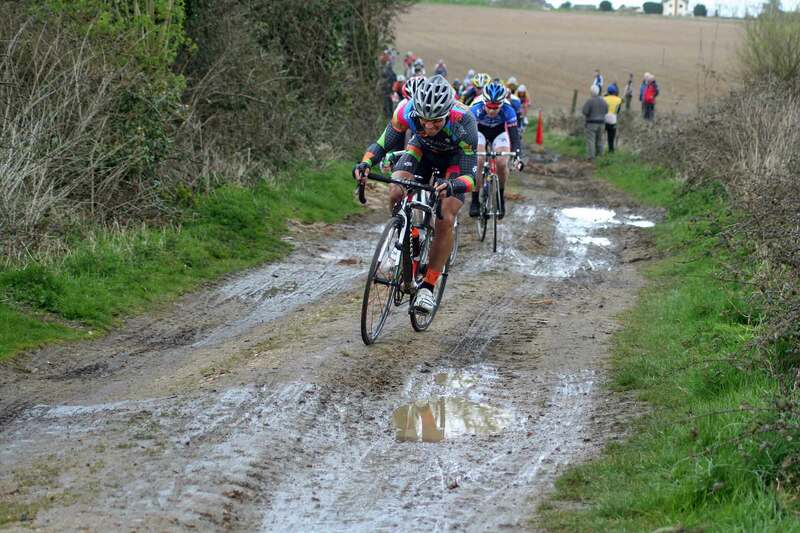 While most amateur races follow the road, Dengie follows a mixture of green lanes and paths. As with Paris Roubaix, it has parcours that is designed to strike fear into those who decide to ride…” Guy echoed the true sentiment of the race in this feature and it also underlined Rouleur’s own raison d’être to do something a little left field. Rouleur at that time was known for out of focus grainy colour or black/white pictures and shocking to some without a bike in shot – of course all this was intentional and it added a huge degree of soulfulness to their words that few had managed up to then or since. The 2008 edition based upon the town of Burnham on Crouch, was a race for local heroes such as Alistair Tullett (13th spot), father of the sensational Dan and Ben Tullett. By 2012 it had become a round of the prestigious Premier Calendar for Elite riders in the UK (see Video below). Nonetheless the basic values of the race never changed – windswept flat and narrow metalled public roads linked together by ‘green lanes’, farm tracks and restricted private byways which most often were simply catastrophic in nature featuring jaw dropping pot holes and tractor tracks. Alan spent hours talking to locals gaining permission to access these paths of hell and he had to explain why on earth why cycle racers would want to do such a thing. Alan clearly knew that it was a heroic event that oozed atmosphere that had to be held! At the ‘Dengie’ you could feel the race take a deep breath in and then exhale out each time it left the ‘comfort’ of the tarmac road and returned back to it. The race stirred up visceral feelings within yourself ignited by the sound and fury of a peloton hitting a green lane far removed from the homogenised sports presented so often. Each year at the Redbridge Cycle Centre (Hog Hill) in London, a day of racing is held in Alan’s honour and atop the ‘Hogberg’ is the Alan Rosner bench 1941 – 2012. The Dengie Tour race was importantly also held in memory of Chris Negus a local rider who was killed when he was hit a by a racing motorist. Anyone who rode or was at the five editions of the ‘Dengie Marshes’ will have memories of a great race that will live long in the mind as will Chris Negus and Alan Rosner. Note: I missed the first edition of race but then helped out with judging, publicity, course recon and was generally a person to talk to for Alan at all subsequent races.